I had to throw together something for a Halloween party so I searched my house for ideas. After tripping over a 12 year old life size cut out of Dr. Evil several times that my daughter recently broke, I had a brainstorm. I was just going to dress up as Dr. Evil, but since I had the prop, I got creative. I borrowed a baby carrier from a friend, bought a bald head for $6 and went to local thrift store where I happened to find an old Sears two piece grey suit that was just my size for $12.50. I cut the head and hands off of the Dr. Evil poster board and taped them on to the outfit. With a little makeup and my wife’s help the costume was complete! 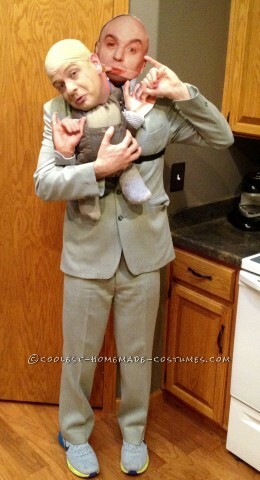 Homemade costume idea posted by Derek B.